Mensusa https://www.mensusa.com/articles/a-sequin-tuxedo-blazer-is-a-specially-handcrafted-blazer.html A Sequin Tuxedo Blazer Is A Specially Handcrafted Blazer Tuxedos undoubtedly enhance a person's looks and status. Wherever you go, a well fitted tuxedo will always speak about your dignity and personality. So visit MensUSA and purchase some of the unique tuxedos like a sequin tuxedo blazer or a camo tuxedo to fortify your wardrobe with multiple tux available at MensUSA. A sequin tuxedo blazer is exclusively designed and worked out by experts in art and needlework to offer the finest sequin tuxedo blazer that will turn the heads of all around. 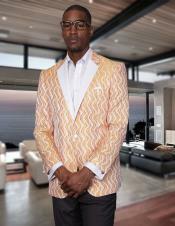 This particular type of blazer enables the wearer to create a style statement of his own. The lapels like notch lapel or peak lapel tuxedo blazers with exterior pockets, two-button closures, and designer cuff buttons are tailored to fit all kinds of body type. They are fully lined with soft satin or silk to offer maximum comfort. The trimmed look of the sequin tuxedo blazer gives the wearer an edge over others. The exclusiveness of the tuxedo jacket lies in the sequin work that are unique and exquisitely designed for a perfect sophisticated look. 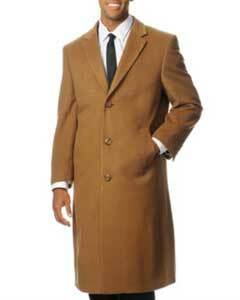 A camel coat is elegantly designed for stylish men as well as women. The coat is knee length and the exclusive shades like burgundy, army green or beige make it the perfect choice for stylish men. The camel coat is a tailored coat that can be worn to get a dressy look by accessorizing it with matching suits or use it to get a sporty look. A pair of jeans and a basic sweater goes well with this attractive camel coat. Since it is a neutral color attire, black and gray colors match it perfectly well to make you look smart and dignified too. Blazers are the best options for all men as well as women and children. There are numerous designs, cuts and designs that cater to the requirements of all men throughout the year. Do you have a camel hair blazer? 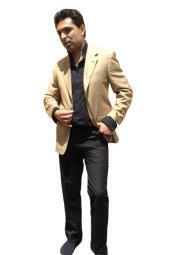 It is one of the most unique blazers that will give you a fashionable and sophisticated look. The camel hair blazer is exclusively designed and crafted for a special look. The blazer is durable and the camel hair offers an exotic appearance to the outfit. The color is neutral and so you can easily match your accessories with a camel hair blazer. At MensUSA you will get a variety of designs and different sizes to cater to all body types. Pick your today and flaunt your exclusive sense of style and personality. A camo tuxedo is the ideal attire that is a combination of classic style and trendy features. You can wear it for almost all occasions. Wearing the appropriate accessories like the camo full black vest with your camo tuxedo will give you an enhanced look that will draw the attention of all at the gathering. This is a good option as a wedding attire also if it is a camo-themed wedding. A perfect choice of camo tuxedo together with an appropriate vest and lapels create a coordinated look for the wearer. 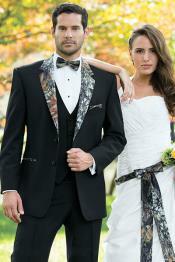 You can easily create your own style statement in a camo tuxedo on all occasions and weddings. A camo tux is a great addition to your wardrobe. Visit MensUSA for the best of designs and highest quality camo tuxedo at accurate prices.